The Maximum number of hops to search for target host in TraceRouteOK is the maximum number to resolve routing loops! 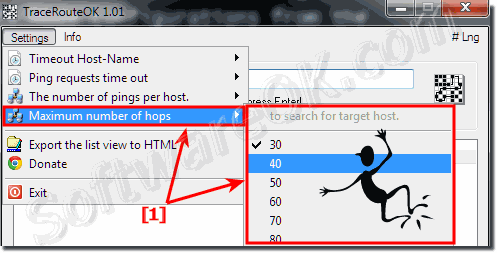 (Image-1) Change maximum number of hops to search for target host! (Image-2) The number of route loops to google.com! TraceRouteOK - FAQ-2: What is maximum number of hops to search for target host?